The muse for this diary is far from hot off the press. 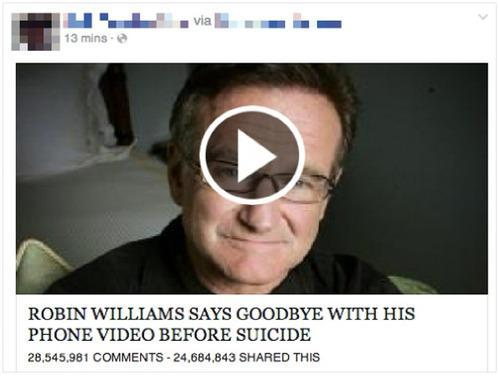 Many of you may have already come across the click through scam on Facebook reporting a video recording taken of Robin Williams moments before his death. In case you had not heard, Robin Williams is a popular American movie actor and entertainer that recently took his own life at the young age of 63. The general public's open expression of grief for his passing has given some evil doers an opening to take advantage of human emotion. Snopes.com has a write up on this scam. I can offer a couple of details on it. 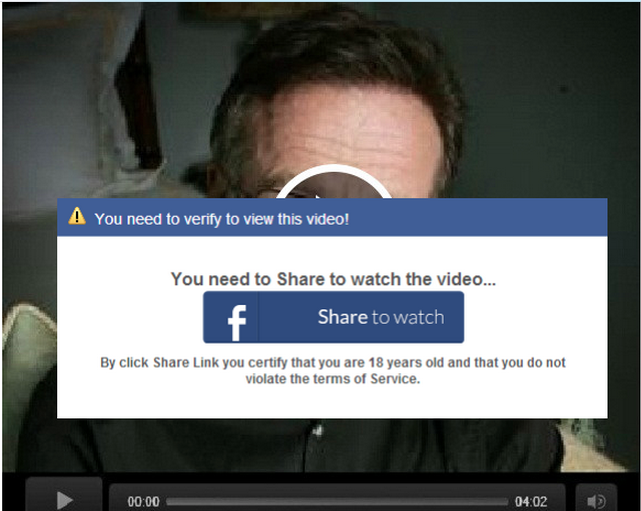 An image like this one will show up in your Facebook feed enticing you to click to view the video of Robin Williams. The following image is the next step. By clicking through this type of scam it opens a list of vectors for the user to be exploited. So please beware, educate your family, friends, and co-workers. Let this also be a wake up call for other soft spots. The ALS Ice Bucket challenge is viral marketing success, that could easily be exploited. So don't always trust and feel the need to meet your curiosity. Sick vile bastards, first his family, now this!! The man and his family led a tormented life, his torment is over but not theirs. Pathetically this is nothing new, the beheading of James Foley will start doing the same, welcome to the world of UNsocial media. You should change the title of the thread.. SICK social engineering is alive and well.